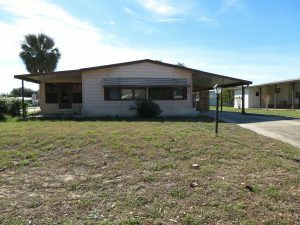 Orlando Retirement Home For Sale – NICE CORNER LOT WITH SPACIOUS 1404 SQUARE FOOT HOME WITH FLORIDA ROOM READY FOR YOU TO FURNISH ACCORDING TO YOUR TASTES!! This home could be a nice vacation home or permanent home with a newer roof replaced last year and a newer HVAC. This property is located in a 55+ gated golf community of Polo Park West. This community features two club houses with two pools. It also features tennis courts, shuffleboard courts, horse shoes, and a 9 hole executive golf course. This home needs some TLC and will make a very nice home! !